Get them talking with this educational and fun book that explores essential words with colorful pictures of children’s favorite animals. Cleverly designed in a large trim size to inform and entertain, this board book is the start of your baby’s learning adventure and introduces them to the words for their favorite animals. Crystal-clear photos show the wonder of the animal world, while engaging illustrations tell simple stories that stimulate talking, from a swan with her baby cygnets to a fish being chased by a smiling (friendly!) shark! Clear word labels encourage pointing, naming, and talking, aiding in early identification and language skills. 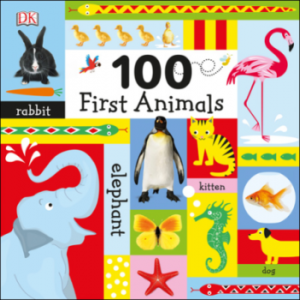 With its sturdy board book format and 14 themed pages covering all the familiar animals little ones are interested in, 100 First Animals is the perfect first book for parents and babies to share.